RTI is a mechanism for manipulating multiple images under different lighting conditions to capture very subtle surface information. At a basic level, it operates under the principle that a surface illuminated at a grazing angle has different luminance to a surface lit from above. 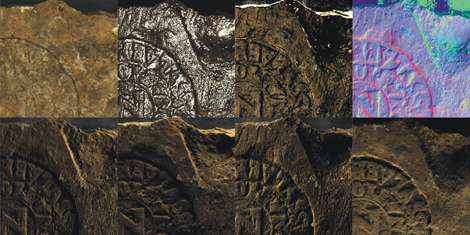 By taking many photographs in controlled conditions, the RTI technique captures a very precise record of changing surface shape. At Portus, the team has employed this methodology in a variety of circumstances, from the recording of portions of buildings and excavated contexts, through to microscopic examination of finds. Such records have proven a useful means to assess necessary conservation measures and degradation over time, but more importantly they have allowed archaeologists and other specialists to identify very degraded details on objects such as brick stamps and coins. Not only is RTI quick and simple to use, but it can be very low cost and, as such, is available to a broad range of researchers. 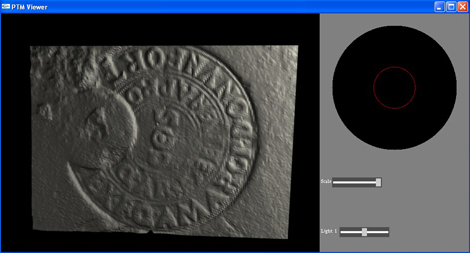 The Portus Project’s use of RTI directly stimulated the subsequent AHRC Reflectance Transformation Imaging from Ancient Documents project which greatly extended the application of the technique, as well as prompted awareness of it across the cultural heritage community and the larger public. RTI at foreground and traditional finds photography in background.